Excalibur Swords for sale include a selection of functional and display swords. They are inspired by the famous Sword of King Arthur. Most of these popular designs include a wooden wall display plaque. 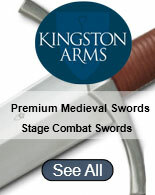 Buy all types of Excalibur swords on sale now.